Product development capability | NAGAE Ltd.
NAGAE takes enormous pride in the fact that Japanese major building material suppliers come to us for answers to their most complex problems. Whatever magnitude of challenge, we never hesitate to take it on. We are confident that our design team and production team have the skills and experience to find the right solution. Furthermore, we are highly knowledgeable in optimizing part design, mould design and construction, die casting alloys, process and quality control and the production of high quality parts while maximizing mould life. NAGAE can offer robust solutions to companies not only in hardware and building material, but also in many other industries. We have had rock-solid relationship for a long time with major building material suppliers in Japan. Our extensive experience and expertise in the field help us develop original products, such as a sliding holder for laundry poles (Refer to original products). Those products retain dominant market position in Japan even under stiff price competition. 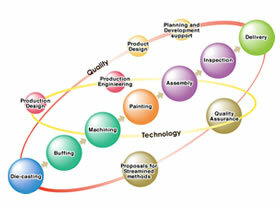 What is more, we manufacture OEM products in a variety of fields. For example, we have a high reputation for technological excellence in manufacturing parts for gas metres, which are required strict air tightness and narrow tolerance. NAGAE has 25 patents/ utility model patents and 20 design rights (as of Nov 2013). We put our developed technology to practical use. Manufacturing OEM products, we have practised flexibility to ensure quality service by listening to your needs, providing customised solutions for a wide range of demands. That makes us possible to develop our original products and expand our business new fields. 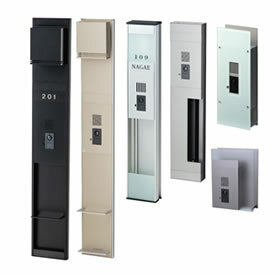 - Offering the outstanding quality and service both in Japan and Viet Nam. Our product design team works with you closely to offer the best solution. Our rich design and top-notch techniques ensure the quality of your products both in Japan and Viet Nam. We use a wide range of manufacturing knowledge and production processes to make our own products. We can offer these capabilities to you. Bring us your ideas! We will help you turn them into high quality products. Contact us freely for further enquiries.